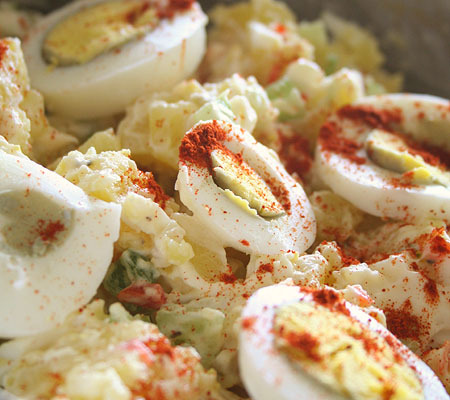 From my earliest memories, family gatherings included this amazing potato salad... This recipe is a family tradition and a mainstay of my childhood. With a minor tweak, the recipe is now clean. Potatoes have gotten a bad rap, but when enjoyed in moderation, they do have a place in the clean eater's life. They're full of B6, Vitamin C, Potassium, Manganese, Magnesium and more! ■ Boil potatoes. You can peel & quarter them before boiling, or just quarter them and peel off the skins after boiling. Drain and allow to cool. ■ Hard-boil eggs. Cool and peel. Set aside. ■ Chop/Dice potatoes into a large bowl (no skins). ■ Chop & dice onion, add to bowl. ■ Dice 6 eggs and add to bowl. ■ Add mayo* and mustard, mix well. ■ Sprinkle in Garlic powder, sea salt and a dash of paprika. Mix well. ■ Slice remaining 6 eggs in half and place on top of the salad. Sprinkle with paprika. Serve immediately, or chill first. NOTE... this is a dry potato salad, not a creamy one. There's no need to increase the mayo. Once you mix it all together, the starch of the potatoes and the yolks of the eggs add a "creamy" feel to it. *The original recipe calls for mayonnaise. 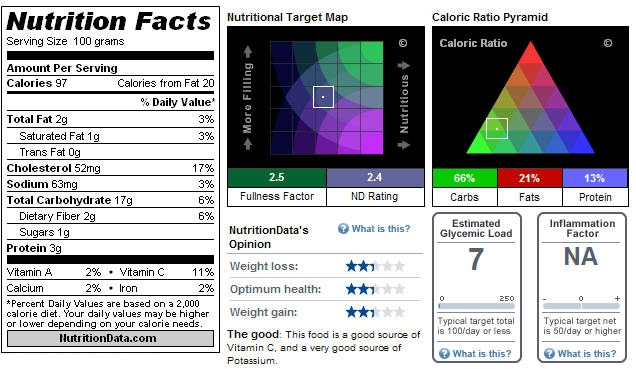 Back in the day, Mayonnaise's ingredient label went something like this: eggs, oil, vinegar, sugar, salt. Today, that label is full of unpronounceable items. Not exactly clean eating. You can either make your own mayo with clean ingredients, or make a careful selection at the store being mindful of preservatives & additives. **The original recipe calls for Garlic Salt. I've replaced this with garlic powder and sea salt. You can replace garlic powder with Mrs Dash Garlic & Herb, if you like. I use sea-salt because it's lower in sodium than table salt.